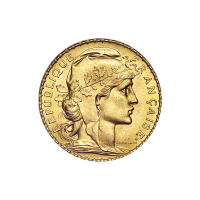 1906 - 1914 French Rooster 20 Franc Gold Coin | ?? 正面 Marrianne as portrayed by J.C. Chaplain. 反面 Gallic Rooster with the year of issue, 20 Fcs denomination and the words "Liberte Egalite Fraternite".